5793 labyrinths found. Showing 5161-5180. Sorted by country, state, city, then zip/postal code. 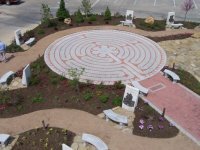 The labyrinth is located on the beautiful grounds of Villa de Matel, the motherhouse of the Sisters of Charity of the Incarnate Word. Located on the western side of Madera Run Parkway, south of the intersection at Cathedral Pines Drive. Labyrinth is on the north side of the campus; walk between the church office and school building to get there. Walk our labyrinth dawn to dusk! It's adjacent to our preschool playground; preschool is active weekdays 9 am - 4 pm during the school year. View of labyrinth from Narthex doors. 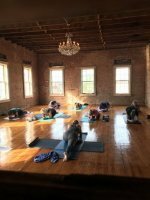 For directions - go to the Chapelwood website listed, click on location to bring up directions and map. 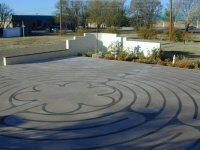 Since the labyrinth is located outside it accessable at all times, but due to location and limited lighting it is best to access labyrinth during office hours. Also, anyone is welcome to attend either the 8:30 or 11:00 services on Sunday mornings and can have access to labyrinth then. To reach labyrinth from parking lot - walk around the front of the sanctuary on grass to the side opposite the parking lot. If sanctuary is open - inside through the main sanctuary doors - walk across the Narthex to doors opposite, the labyrinth is just outside. 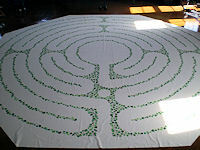 The labyrinth is a 7-circuit "Circle of Peace" design. It was constucted using the bricks set at ground level to form the circles with the grass becoming the path. The St. Timothy's labyrinth is located in a quiet wooded area near Oyster Creek. Park at the parking lot at the east side of our buildings. Walk north along the stone pathway, which leads to an outside chapel and the labyrinth. Open during daylight hours. There is not enough lighting for nighttime visits.